Annual. Helianthus annuus. This variety produces colorful blossoms of small 4" to 6" flowers. 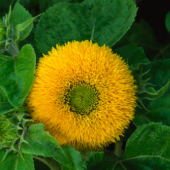 This sunflower has large golden orange blossoms with short stems. Excellent for fresh bouquets and flower arrangements. As adorable as a toy Teddy Bear. Annual flowers do best when planted indoors and transplanted outdoors when danger of frost has past. Plant your seeds indoors, 5 to 7 weeks before setting outside. For tiny seeds, do not cover with seed starting mix. Just sprinkle the seeds on top. Transplant them outside in garden when seedlings are established. Plants can grow 1 - 3 ft tall. Water well during dry and hot spells. Use RootBlast, Vegetable Alive, and Slow Release Fertilizer when transplanting outdoors. Apply Miracle Gro periodically. Snip the stems with garden scissors when flowers are in full color.